As the first President of the United States, George Washington was seen as an admirable man. There was a mythological saying that Washington could not tell a lie when he told the truth about cutting down his father’s cherry tree. However, many fail to conceive that there is a dark side to George Washington’s history and his admirable reputation; George Washington was a slave owner. On the day of George Washington’s death, there were more slaves that surrounded him than whites. George Washington was the owner of 123 slaves, not including the slaves that were owned by his wife Martha. In George Washington’s last will and testament, he decided that he would free all of his slaves after the passing of Martha, except for one, Oney. She will be talked about later. George Washington did not want to split up his slaves and Martha’s slave, as some slaves had intermarried and raised families. George cared for his slaves while on his deathbed; he forbade selling his slaves and provided them with education towards his end years on Mount Vernon. 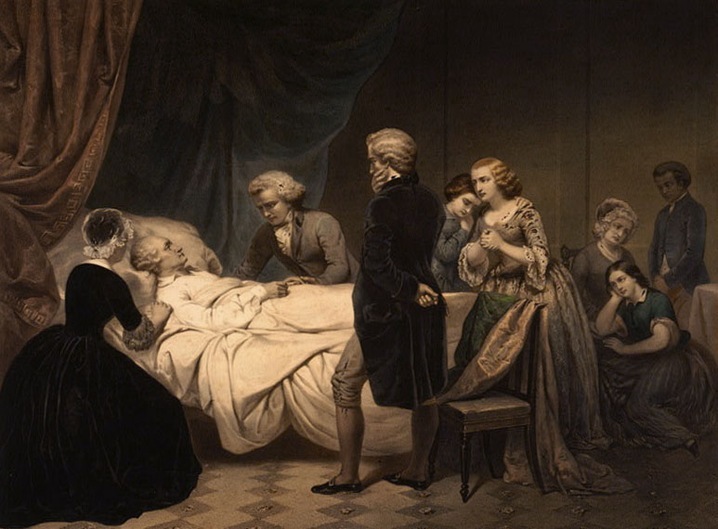 An artistic depiction of George Washington’s death. Notice how there is only one slave shown in the picture. During the first years of George Washington’s life, slavery was the usual to him. The culture of the time was an influence on his idea that having slaves were normal. Ten slaves were given to George at the age of eleven after his father’s death. Washington’s luck in slavery grew when he inherited more slaves from his brother’s passing and would eventually move his slaves to Mount Vernon. George bought sixteen slaves a year before marrying Martha. After George and Martha were married, George Washington shared eighty-four slaves with Martha, slaves previously owned by her late, first husband. He hit the slave jackpot. Each year, George kept on gaining more slaves between 1761 and 1773. George was not a friendly slave owner at first. He expected his slaves to work around the clock for him and would whip them if they disobeyed. He was even angered when his slaves were unfit to be sold because they weren’t in the best shape. George Washington was known to belittle blacks as he often compared them to being uncivilized. In 1751, George Washington traveled to Barbados to visit is ailing brother. Slavery was the backbone of civilization in Barbados. Washington felt no empathy towards the slaves and acted as if they were invisible. Runaway slaves were a major and constant problem for Washington. Forty-seven of Martha’s slaves ran away. George Washington would get so aggravated when his slaves ran away, and would punish them severely. He even sent off one of his slaves, Tom, to the West Indies as punishment for running away. Oney Judge and Hercules, both domestic slaves, ran away from the Mount Vernon plantation. Oney was the personal slave to Martha, and Hercules was the cook at Mount Vernon. These two slaves held insight to how George Washington treated them as a slave owner; they ran away. Hercules vanished without a trace. However, Oney persevered to gain her freedom. She was never going to be free, but was to be handed down to Martha’s granddaughter instead. Knowing she could never gain her freedom, Oney walked out of the Washington’s house, located in Philadelphia, never to return. George Washington was so angered at her disloyalty that he refused to free her, even in his will. However, Oney didn’t regret her decision to runaway, even though she would not be seen as a free person in her lifetime. Washington began different interactions with blacks during the French and Indian War, when he met a black Frenchman. He described this Frenchman as intelligent. By the 1760s, Washington began to see the effects of slavery as he began to work more on his plantation. He made blacks supervisors on his plantations and allowed black doctors to care for his slaves, with pay. Washington took a long time before he saw flaws in the slave system. During the American Revolution, Washington was at a crossroads. He knew that the revolution’s sentiment called for the end of slavery, but he still personally supported slavery. He was at a crossroads between his own ideology, and the calling of a new era, an era without slavery. In 1786, Robert Pleasants, a Quaker native to Virginia, wrote to Washington at Mount Vernon. Robert Pleasants had freed his slaves, and took the initiative to tell Washington that he should free his slaves, or his character would be tainted. After this encounter, Washington began to write letters calling for the termination of slavery. George Washington was writer on the topic of slavery later in his life. Washington had a huge library collection that contained seventeen books on the topic of slavery. In Washington’s library, there was antislavery information pamphlets that he kept together by sewing them, indicating he cared deeply for these pamphlets. Not only did Washington have an extensive collection of books, he wrote letters to others about his view on slavery. In a letter from George Washington to Charles Pinckney, there was a discussion of a law that would prohibit slave importation after March 1793. To the dismay of George Washington, he was upset that this piece of legislation would not prohibit all importation of slaves. Washington also mentioned that slavery was going to have ominous consequences. However, Washington was more concerned with a united nation and knew that the slavery issue would lead to a divide. In a private statement not meant for the public, Washington stated that he regretted his employment of slaves and hoped for slavery to end. Washington hoped to free himself from being known as a slave owner to convey his final opinion on slavery: it was a troublesome system. His struggle on the slavery issue was long and hard, and he even thought about his slaves until days before his death when he drafted his final will to free his slaves. Washington overcame his thought that it was his inherit birthright to rule over slaves with an iron fist. He believed in a future with no slavery that would be positive and believed that education could prevent negative effects of slavery. However, Washington failed to free his slaves within his lifetime. As quoted from the article, “To Get Quit of Negroes”: George Washington an Slavery, “Washington freed his slaves for three basic reasons: profit, principle, and posterity.” Now you decide. Was Washington a cruel slave owner with a dark history? Or did he have a change of heart, all the while overcoming the cultural norm that was slavery? Furstenberg,, François. “Atlantic Slavery, Atlantic Freedom: George Washington, Slavery, and Transatlantic Abolitionist Networks.” William and Mary Quarterly 68.2 (2011): 247-56. EBSCOhost. Web. 22 Feb. 2015. Morgan, Phillip D. “‘To Get Quit of Negroes’: George Washington and Slavery.” Journal of American Studies 39.3 (2005): 403-29. EBSCOhost. Web. 22 Feb. 2015. Pierson, Sarah. “Oney Judge.” George Washington’s Mount Vernon. N.p., n.d. Web. 15 Apr. 2015. <http://www.mountvernon.org/research-collections/digital-encyclopedia/article/oney-judge/&gt;. Washington, George. “From George Washington to Charles Pinckney, 17 March 1792.” Letter to Charles Pinckney. 17 Mar. 1792. From George Washington to Charles Pinckney, 17 March 1792. Founders Online. Web. 22 Feb. 2015. First Photo: Stearns, Junius Brutus. “Life of George Washington The Christian Death.” PBS. N.p., n.d. Web. 14 Apr. 2015. <http://www.pbs.org/newshour/rundown/george-washingtons-medical-chart/&gt;. Second Photo: Stearns, Junius Brutus. “Life of George Washington: The Farmer.” Wikipedia. N.p., n.d. Web. 14 Apr. 2015. <http://en.wikipedia.org/wiki/Oney_Judge&gt;. This may be nitpicking. If it is, I’m sorry. You say, “Washington overcame his thought that it was his inherit birthright to rule over slaves with an iron fist. ” Do you mean he thought it was his inherited birthright, or his inherent birthright? Did it come to him through his father/bloodline, or through something integral to his person? I think this actually could have dual meaning. In a sense, the fact that Washington inherited his slaves when his father died did fuel his belief that it was inherent or natural that being a white planter of English background meant that he would and should own slaves. So perhaps as written it is a little imprecise. But I also do think there is an interplay here between birthright and GW’s ideas on race. Thanks again for the comment, hope this makes sense?